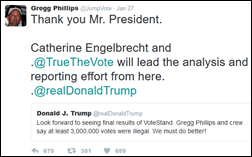 VoteStand vote fraud reporting app developer Gregg Phillips, who President Trump credits with convincing him that 3 million people voted illegally in the November election (all of them for Hillary Clinton), has a healthcare IT connection – he’s the chairman of AutoGov, a Medicaid eligibility decision support tool vendor. The product’s description suggest that it works similarly to his vote fraud analysis methods, merging databases together to provide a full eligibility picture of Medicaid applicants. 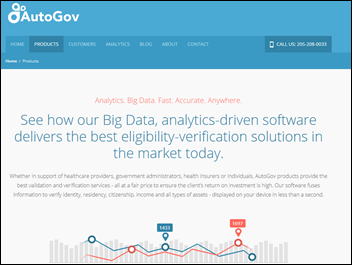 AutoGov markets its big data-powered system to providers as, “You will be able to decide whether or not to admit a Medicaid patient with just a touch of a button.” It is powered by scoring algorithms that use data from 30 million cases. Phillips, a former Texas Deputy HHS commissioner, says he augmented a 180 million-row voter registration database with other databases and geocoding data, giving him the ability to verify identity, residency, and citizenship status, although others have questioned his claim. He said in a CNN interview Friday he won’t be able to release specifics for several months given the analysis required and the demands of his day job. From Is This Even Still a Thing? “Re: booth babes. 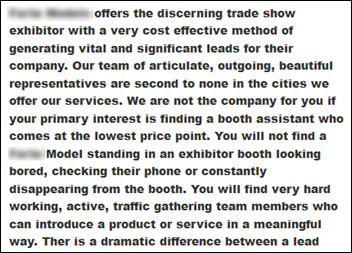 I just got this pitch.” An Orlando modeling agency warns HIMSS17 exhibitors of the peril of hiring “below-average young women” to draw traffic, introduce products, and generate leads. I think I should run a honeypot sting operation to focus on the demand instead of the supply, setting up a fake HIMSS booth staffed by an “above-average young woman” from this agency. Each time our booth babe lures a gawking attendee into the booth, I would emerge with microphone in hand like that solemn-voiced talking head Chris Hansen in “To Catch a Predator,” inviting the now-squirming attendee to have a seat and explain to my on-camera audience (and to their colleagues and families) what they hoped to gain. From Research Expert: “Re: HIStalk. I read it every day and find it extremely valuable. Good thing it’s not more organized or it could put many of the advisory firms out of business. 🙂” Thanks. I’m more of a real-time fire hose since I don’t like to recycle old news just to earn reader clicks while insulting their intelligence, but I could probably get someone to repackage the already-vetted information stream into something that could be useful in a different way. However, my inherent laziness makes that unlikely. HIStalkapalooza invitations will be emailed by Monday. Every year we invite people who claim we didn’t, as our email was apparently blocked by their overly aggressive spam filters (the invitation will come from eventbrite.com). 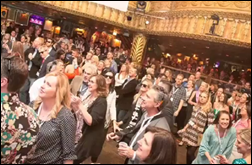 Important: you MUST click the link on the email invitation link called “Attend Event” to complete your signup, otherwise the check-in system won’t recognize you at the House of Blues and you’ll be slinking away crestfallen to the sounds of the link-clickers inside slurping down drinks, loading up plates, and performing their pre-dance stretching. A shortfall in sponsor money means I can’t invite everyone who asked to attend, unfortunately. The pecking order is providers first, then two people from each HIStalk Platinum sponsor, then I just try to choose a good mix of job titles and companies until we hit the number I can afford (since I’m paying thousands out of my own pocket). I’ll ignore emails asking for exceptions, explanations, or anything else event related – it’s just a party and nobody will suffer from starvation, dehydration, or dance deprivation for lack of attendance that Monday evening. Like a concert or sporting event, each person must have an individual ticket that will be scanned at the door. Cumberland Consulting Group is a leading healthcare consulting firm that helps some of the nation’s largest payer, provider, and life sciences organizations implement and optimize technologies to maximize operational efficiency. Cumberland delivers comprehensive consulting services with a focus on strategic advisory, implementation, optimization, and outsourcing. The firm excels at system selection and planning, implementation project management, system optimization, and performance improvement. In addition, Cumberland offers high-quality, certified resources to support your most complex IT projects. For more information on Cumberland’s services, visit their site. 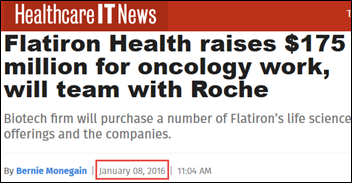 Dear HIMSS-owned publication: apparently you failed to notice that the press release you used as the sole, uncredited source for your just-published breaking news article was dated January 6, 2016. You already reworded that press release in calling it news on January 8, 2016 (although even then your sub-headline made no sense). Could you perhaps apologize to the 400 folks who have shared your “news” so far this week since you’ve made them look stupid in mistaking a year-old announcement for something new? Thank you. About half of poll respondents reacted negatively to the announcement that HIMSS is starting a conference and media group that will cater to vendor members targeting provider members, while 17 percent like the idea and 31 percent don’t care either way. HIS Junkie sagely comments that if HIMSS were truly member-driven, it would set up a division and conference to teach providers how to negotiate with vendors and to get better contracts, but as he notes, there’s no money in that. New poll to your right or here: why are you going to the HIMSS conference? (a question I ask myself every year about this time). 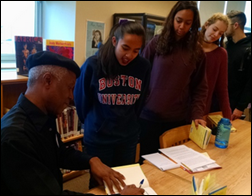 Ms. H asked for financial help via DonorsChoose to continue her New York high school’s “Guest Writers” series, which we provided. 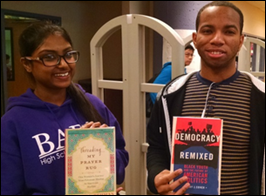 She says students have enjoyed getting a behind-the-scenes look of how books are written, edited, and published as described by award-winning authors who visit with the students. McKesson announces that it will acquire CoverMyMeds for up to $1.4 billion. A federal judge rules against the proposed merger of Aetna and Humana, citing anti-competitive concerns. GetWellNetwork acquires Seamless Medical Systems. Former National Coordinator Karen DeSalvo, MD, MPH joins her fellow HHS political appointees in leaving government service with the administration change. Harris Corporation will sell its government IT services business to Veritas Capital for $690 million in cash, which doesn’t sound like much for a division that’s generating $1 billion in annual revenue. Hospital staffing firm Jackson Healthcare will build a $100 million, 306,000-square-foot expansion to its Alpharetta, GA headquarters that will house 1,400 new employees. 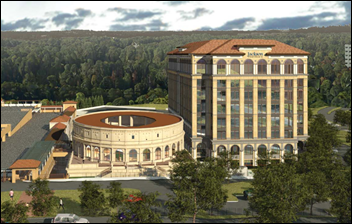 It will include a 39,000-square-foot amenities building modeled after the Colosseum in Rome that will house a gym, pool, restaurant, hair salon, dry cleaner, spray-tanning studio, chiropractor, masseuse, and barber. The company took in $800 million in revenue last year. 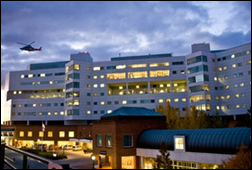 University of Virginia Medical Center (VA) chooses clinical process measurement solutions from LogicStream Health, which it will use to drive evidence-based best practices in managing and improving its EHR’s decision support tools. 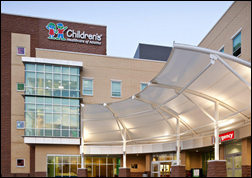 Children’s Healthcare of Atlanta selects Voalte Platform for care team communication and alert notification. CHI Franciscan Health chooses Clearsense analytics to aggregate and organize patient data for clinical decision-making. Memorial Hospital Of Carbondale (IL) will switch from Meditech to Epic in June 2017. Trinity Rock Island (IL) will replace BD Pyxis MedStation with Omnicell in summer 2017. Centura Health – Porter Adventist Hospital (CO) replaced Meditech with Epic in October 2016. 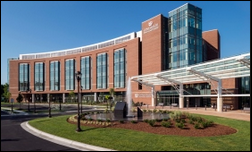 Elmhurst Memorial Hospital (IL) went live with Epic in October 2016. Will Plourde (HealthcareSource) joins LiveData as VP of engineering. McKesson’s IKnowMed tops Black Book’s oncology-hematology EHR satisfaction ratings for the sixth straight year. An employee of Campbell County Health (WY) sends the W-2 information of 1,400 employees to a hacker impersonating a hospital executive who asked for all forms for 2016. A Johns Hopkins Medicine study finds that, not surprisingly, clinic doctors who are running behind schedule unintentionally shortchange patients in trying to catch up. A woman sues Cone Health (NC) for trying to collect the unpaid medical bills of her deceased husband, seeking class action status under a clause in the state’s constitution that says the property of a woman can’t be attached to pay for the debts of her husband. ACA architect Ezekiel Emanuel, MD, PhD scoffs at the idea that technology can replace doctors and that wearables can improve health, arguing that the tech sector is missing the point that resolving a technology-identified problem still requires a face-to-face doctor-patient encounter. He says technologists should focus on solving health problems like heart disease and obesity instead of obsessing about new monitoring tools, saying that even a cure for cancer would have a minor impact on life expectancy compared to reducing smoking and high blood pressure. An Ohio man is charged with arson and insurance fraud after police get a search warrant to review his pacemaker data and find no evidence of heavy exertion at the time he claimed he was quickly packing and lugging heavy belongings out of the house as the fire spread. A Hauppauge, NY doctor is convicted of selling opioid prescriptions by instructing his assistant to set up phony EHR exam and treatment records for anyone willing to pony up $120 in cash, all while he spent most of his days out of the office playing hockey. Arcadia Healthcare Solutions wins top honors from Frost & Sullivan for its clinical and claims analytics platform. PeriGen publishes slides from its presentation on “The New Labor Guidelines: Benefit or Harm” presentation at the Steamboat Perinatal Conference. Phynd will exhibit at the North Carolina Epic User Group Meeting February 8-9 in Greensboro. Red Hat technologies support TransUnion’s migration to a new IT environment. Wharton Research Data Services adds SK&A healthcare data. Isn’t the Centura Hospital going live on Epic in 6 months old news? That decision for all intents and purposes was made over 2 years ago. So the doc prescribing the opioids was caught playing hockey, and not hookey? What is this world coming to? 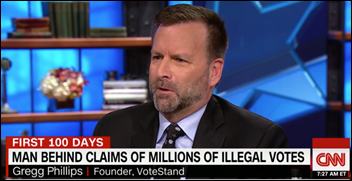 Worth noting that the “vote fraud” guy owes the IRS $50-100K (meaning the rest of us have to pay more) and has a history of massive conflicts of interest at his gov jobs in Alabama and Texas, steering contracts to companies he has an interest in. Not sure why anyone believes his vote database or his Medicaid database aren’t equally suspect. On the other hand not paying your taxes, dealing fraudulently with your customers and suppliers, and having massive conflicts of interest seem to be a pre-requisite for certain government jobs these days. 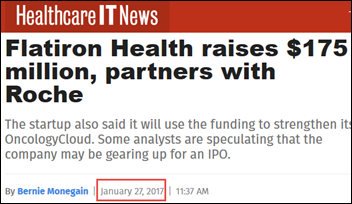 The Healthcare IT News article looks fine. It’s a look back on the original piece. It looks fine now that they’ve hastily changed it to hide their error, in which someone who’s not yet used to the idea that it’s 2017 mistook a January 2016 press release for breaking news and ran with it. Check my screen shot and link above — they tweaked the article to make it look like they were updating the original when in fact it contains nothing new and then links back to the original to make it seem intentional when it clearly was not. They list five full-time editorial people, which even with light relevant education and experience should be able to fact-check a press release. I saw that Healthcare IT News had changed the article when busted. The beauty of the Internet is that you can change anything — so long as those meddling kids (or aging HIT bloggers) don’t capture a screenshot!